If you are considering hip surgery the following total hip replacement information might help you understand the procedure and implants better. Your hips work hard during your daily routine, and arthritis of the hip or a hip injury can make it hard for you to perform normal tasks. If your injury or arthritis is severe, you may begin experience pain when you’re sitting down or trying to sleep. Sometimes a total hip replacement is the only option for reducing pain and restoring a normal activity level. If you and your doctor decide a total hip replacement is right for you, the following information will give you an understanding about what to expect. A total hip replacement involves cutting away the damaged bone of the hip joint and replacing it with a prosthesis. This "new joint" prevents the bones from rubbing together and provides a smooth hip joint. 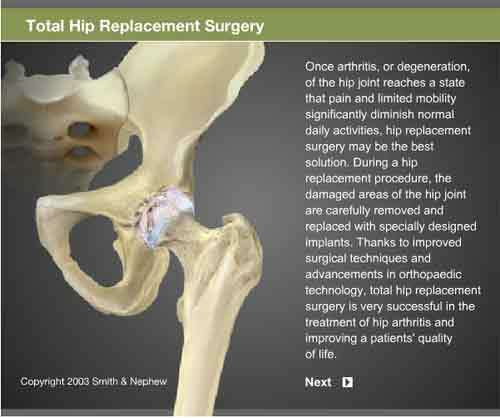 In the total hip replacement procedure, each prosthesis is made up of two major parts. The femoral component is a metal shaft with a ball on the end and replaces the top of the femur. The acetabular component replaces the socket side of the joint and is made of a metal cup and plastic liner. Before you are taken to the operating room you’ll be given medication to help you relax, and the anesthesiologist will talk with you about the medications he’ll be using. In the operating room, you will be placed under full anesthesia. Once you are "under" the surgeon will begin by making an incision in your leg to allow access to the hip joint. He’ll then expose the joint and place a cutting jig or template on the end of the femur, or thigh bone. This jig allows the surgeon to cut the bone precisely so that the prosthesis fits exactly. Once the femur is cut, the inside of the bone will be prepared so that it closely matches the shape of the femoral shaft your surgeon has selected. Then the the cup portion of the pelvis is prepared with cutting tools so that the metal cup will fit exactly. Now it’s time to place the prostheses. This begins with the femoral prosthesis. For some patients, an acrylic cement called Polymethylmethacrylate (PMMA) will be used for the fixation. This cement has been used successfully by orthopedists for over 25 years. It is a strong material, well-tolerated by the body and sets or cures within 15 minutes after it is mixed. Before curing, the cement is pressure-injected and the implants are seated. For other patients, the implants are able to be affixed to the bones without cement. 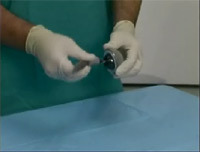 Special surgical instruments are used to precisely prepare the bones so as to enable a press fit. To supplement this joining, suportive screws or pegs are often used. Bone is a living and growing tissue. If an implant coated with metallic beads to form a porous undersurface is placed in very close contact to living bone, tissues can grow into the pores, further locking the implant in place. Porous-coated hip prostheses have been used for many years and have shown excellent results in many patients. Finally, the incision is closed, a drain is put in, and the post-operative bandaging is applied. You will be discharged when you can get out of bed on your own and walk with a walker or crutches, walk up and down three steps, bend your knee 90 degrees and straighten your knee. At home you should begin ambulation with a cane as tolerated. Keep your incision clean and dry and watch closely for any signs of infection. You’ll continue your home exercise program and go to outpatient physical therapy, where you will work on an advanced strengthening program and such programs as stationary cycling, walking, and aquatic therapy. Your long-term rehabilitation goals are a range of motion from 100-120 degrees of knee flexion, mild or no pain with walking or other functional activities, and independence in all activities of daily living.